Dr. L. J. Findley, Romford, refused to see me. 1997. 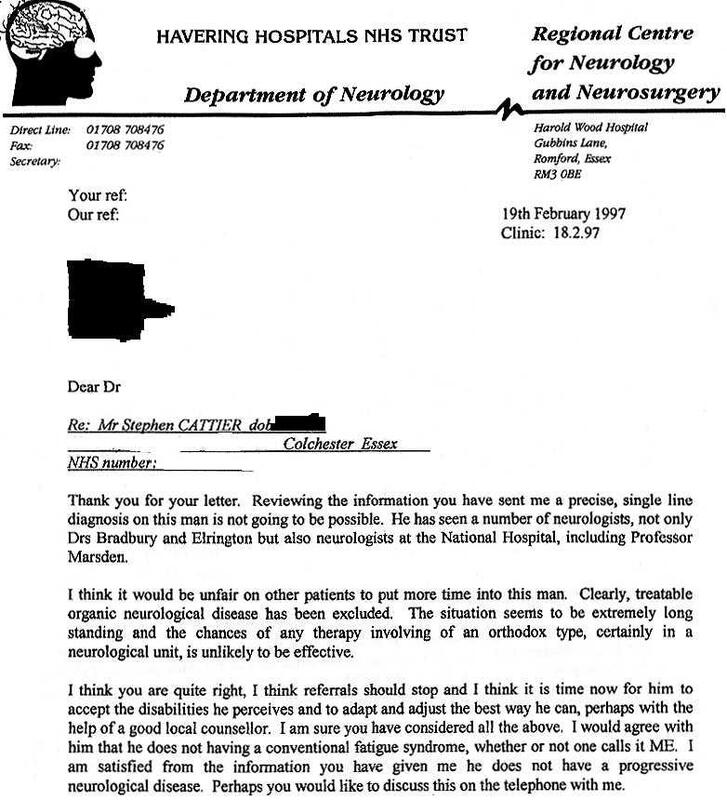 A new new GP said I could have one referral only to a neurologist. I chose Dr. Findley because his waiting list was far shorter than Dr. Goran Jamal's in Scotland and he had already said he would see me when I wrote him. However, he changed his mind upon receiving the referral. I never saw Dr. Bradbury but wrote him instead and so the GP made a mistake there. He had a mountain of case notes to go through so its no wonder. I vaguely recall seeing Dr. Elrington. I know I wrote him but will have to see my case notes in order to find out if I saw him or not. I wrote to Dr. Elrington again in March 2005. Dr. Findley was not open-minded enough like his colleagues with all due respect which means the proper tests have not been done. He was right in that I mainly do not suffer from tired feelings like fatigue i.e. ME, but my muscles do fatigue owing to the mind running out the fuel which makes them work.